Board members Drew Wilson, Pete Ruscitti, and Scott Therkalsen listen to presentation on the proposed project on Brighton Avenue. 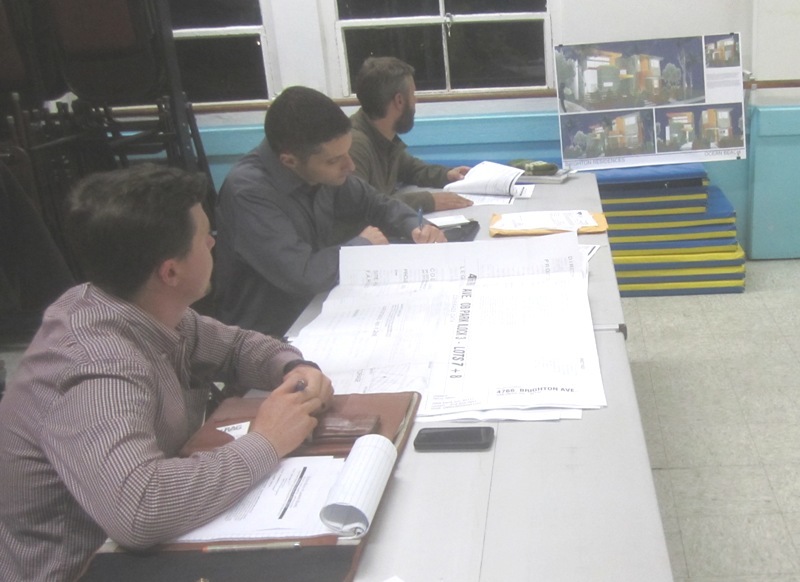 Last night, Feb. 19th, the Project Review Committee of the OB Planning Board met to check out a project proposed at 4766 Brighton Avenue. And after extensive questions and comments by board members, the applicant and audience members, the reviewers voted to send the project to the full board without approving or denying it. Without making a decision on the controversial project, they punted it to next month – entirely in their right to do so. The full board next meets on Wednesday, March 5th. Whereupon, the applicant – Yale Jallos – will presumably return with promised changes to the design of the buildings and their placement. Artist renderings of current design for 4766 Brighton Ave.
Jallos is proposing to demolish the existing one-story, older house on a 5,000 square foot lot he and his family own, and build two 2-story homes alongside each other, one with a carport and one with a garage and roof terrace – but these could change. Some neighbors were also present voicing their concerns and objections, and others their approval. Initially, Jallos tried to object to the OB Rag taking photos of his design or of the meeting, but was assured that it was a public meeting, therefore photos were okay. Vice-chair Pete Ruscitti brought the meeting to order a few minutes after 6pm. Tom Gawronski, Board Chair, Drew Wilson, and Scott Therkalsen joined him in reviewing the one project on the agenda. The applicant claims the unusually large OB plot is already divided into two lots, “Lot 7? and “Lot 8″ (side-by-side ) and his plan is to build a 2 story single family house with a covered carport, totaling 1,820 square feet on “Lot 7″. And on “Lot 8″ to build a second 2 story house, smaller – coming in at 1600 square feet -with a garage of 232 sqft. Either the house or the garage would have a roof terrace. That’s a FAR of .73 (Floor Area Ratio). The designs for the two houses are very similar to the designs of the houses Jallos and his father, Henry, built on their former property just across the alley from the present Brighton Avenue property. Those two sit at 4773 and 4775 Long Branch. 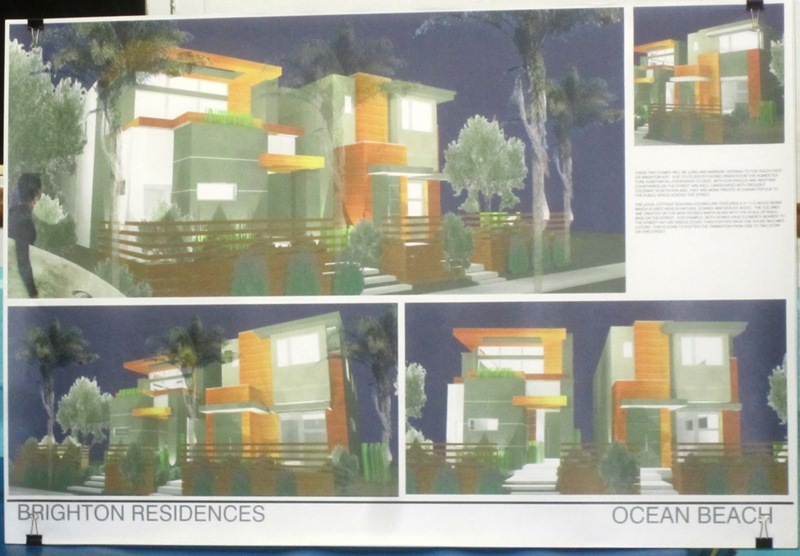 The Jallos consider their designs “very modern” compared to the “traditional” designs of most home in OB. They plan drought-tolerant landscaping in front, the houses will be readied for solar, they want a six-foot fence also in front to help create a “court yard” effect; the design maxes out the side set-backs, in other words, the design includes the least distance between buildings allowed by the community design. There’s 6 feet between the buildings down the middle of the property and no windows. The younger Jallos said he was planning on living in the unit on the left in the design graphic. Peppered by questions and comments from the Board and the audience, Jallos kept his composure and never seemed frustrated. He kept saying that he understood the objections, and he would do this or that to the design – but he had trouble appreciating that the basic message Board members were giving him was that his design was not compatible or in harmony with the OB Community Plan. Some of the objections from the Board and audience were that the house on the east side of the lot would block out sun and light of the neighbors. Jallos said he could push that house back on the lot and alter the roof by slanting part of it. Actually, in compliance of the 30 foot height limit, he said his roofs come in at 23 or 24 feet. Jallos said he also needed the 6 foot fence – the top 3 feet are partially open – due to the proximity of the church and its traffic and the drunks that walk by. When Jallos repeated that he planned on living in one of the houses, that prompted a response from one Board member who said that he voted for Jallos’ last project because that is what he said then also. Since then, Jallos and his father sold the two units they had built on Long Branch. The last time you were here you said your unique design added character to the community. Now there’s 2 of the same. A neighbor to the new proposed project, Lisa Shook had complained that there was not any updated City review available. She then proceeded to read a letter from another neighbor, Dixie Bryant, who could not make the meeting. Bryant’s letter spoke of how the original OB plan was written to keep this type of structure from being in OB. “It’s not compatible with the rest of the block,” Byrant said through Shook. Bryant called the architecture “shoe-box prisons” – and there wasn’t adequate landscaping in the plans, and that the developer planned to cut down two large trees in the process. In contrast, one young man in the small audience said that he appreciated the design. He had actually bid on the other Jallos very-similar property that they had sold on Long Branch. “I appreciate the variety,” he said and said it was “eclectic” and it had attracted him to the neighborhood. Jallos asked the Board for suggestions on how to improve his design. One member responded: “Step both houses back would help.” Other changes given were to avoid the blocking of sun and light to the neighbors. There’s a high ownership on the street. A lot of re-do’s on the street. Part of the OB Community Plan requires building things in harmony with what’s in or on the block. One thing that’s good is not maxing out the set-backs. He claimed he can make the changes in the design by March 5th. The reality is that it’s up to City staff, but it sounds like you want to work with us, work with community. The design has to be consistent with the community plan, and some of it is a judgement call. He continued, saying he could “live with” the house on the left with more of a set-back. But, he said, “The right one has impacts on the neighbors; the left one impacts the right. Can’t approve the right one. I gotta have that fence with all the drunks walking by. The back and forth between board members and the applicant continued for a few more minutes. It sounded to the Board that Jallos was willing to alter his design, push the right house back. So, a vote was taken of the remaining three Board members to send the proposed project to the full board without actually taking a stand on it. The project slated for 4766 Brighton will be back. This is the same board that voted in favor of a 40′ office trailer in the middle of a beach parking lot !, the first place visitors come to in Ocean beach ! Now they want to pick apart a project as if it was their personal choice ? read the comments by the Chair of the board and others it’s their PERSONAL opinion. They even quote the precise plan !, the same plan that said the trailer has to go ! Clean the board up of these idiots and you may be taken seriously someday. Try to refrain from calling every one in town an idiot, and perhaps you too will someday be taken seriously. Seriously. You don’t always have bad ideas, but your approach is immature. idiot yourself – the community elected these people and no body elected you or the developer that you are rushing to defend. Bodysurfer dude – C-mon, you too need to calm down. Can we all agree not to call each other “idiots” in order to carry on a decent discussion? i sorry. how about you obracer? There are many open seats on the board. I’m sure one of them is actually in your district. The community would benefit from many different viewpoints on the board. I’d encourage you to channel your passion for Ocean Beach into one of the organizations that works to improve the town and help improve that organization if need be. I personally love the design. Just because it’s modern doesn’t mean it has no place here. Sometimes I feel like the OB community rejects change as much in some realms as conservatives do with some social issues. It’s not like these are gaudy mansions or apartments. And it’s certainly more aesthetically pleasing to look at than some of the many dilapidated and aging “traditional” properties. I am a fan of their previous design on Long Branch . They claim not to be the fashion police, but that’s exactly what they are TRYING to do here. Ignore them Mr Jallos, move on to the city planning department. These ideas are coming from the same people that think gravel means landscape. obracer – Please calm down. Local heroes should try to be understanding and tolerant of others who are trying to help OB. The planning committee of OB was and is democratically elected to enforce a grassroots-consensed document called the OB Precise Plan. Many of us are watching the board people to make sure they do indeed make the community plan a reality. What are you saying here? You’d rather have the City decide – the city that arrested you and charged you with a felony for hedge trimming? C’mon, man. Have some faith in your community institutions that OBcians helped form. Molly, I trust the City planning department will follow local code. At the end of the day it was a couple police officers and detectives that showed the entire city how THEY could not be trusted, the system worked, the charging agency dropped all charges. Just like the current scandal for police, a few bad apples doesn’t convince me all police officers are sexual predators. The city will treat this applicant with respect, something these board members couldn’t do. IMO the board lacks integrity. I like the diversity in design….it fits with OB many different styles built over the years. If the planning board doesn’t like the 6′ fence here…then code enforcement should hit all the properties that have fenced off their front yards. Ok Debbie, let’s call the city code enforcement people – if they have the staff due to budget cutbacks by the Republican-led city. whoa, you land lubbers are at it again. from my understanding of city history 6 foot fences are verboten (wow! spell check had german!) and for good reason. Two on one lot. Density rises. I agree, idiot was bad word to use. I APOLOGIZE ! I’m not defending the developer, Some board members own more property than developers. I’m defending a property owners right to decide what to do with an investment or future home within the CITY’S guidelines versus the personal choices of board members. This board often makes decisions based on feelings not fact or local code. Work with the neighbors, move on to the city. It’s not the boards business if the applicant is going to live on the property. Elected by the community ? give me a break ! Whats the total number of votes compared to the population of Ocean Beach ? Other than this forum, when and where have you seen notice of these meetings and elections advertised in the community they claim to serve ? it would not benefit those involved to reach out and include the entire community in their decision making process. The more residents are aware of these absurd decisions , the more they will get involved. If you want to reach out to residents on behalf of the planning board and town council ask a few current members to post a sign ” MEETING TONIGHT ” on their lawns, on their store fronts, at the Ocean Beach sign entering O.B., Surf Check Alley, get the word out that day ! we have a short attention span around here sometimes. Most residents are not aware of the meetings. Ehhhhhhhh… I served on the OBPB and may again. I have voted for and against projects just like this, as the margin is thin either way. I voted for Mr. Jallos’ previous project and peeked inside one of them during an open house. It was nice. He’s a good architect. With that said, both if his OB projects are 2-story buildings on blocks that are predominantly cottages, and one can easily interpret the Precise Plan and say that it was an incompatible scale with the neighboring properties. Enough to prevent Mr. Jallos from losing an appeal? Not for me to decide, but I have voted against other projects by other talented architects for exactly that reason. Bottom line is that while the OBPB serves as a second set of eyes on the city’s code, that’s not why they are there. They are there to interpret a policy document, which is inherently discretionary. So long as their “feelings” are based upon an interpretation of the Precise Plan, I don’t think it is fair to call them out on that. While I personally never tried to be the design police or concern myself with whether the applicant was going to live in a proposed building or not, I will say that (a) this same project would be a blocking piece of crap in the hands of a less talented architect, and (b) I can confirm that this applicant did in fact say he was going to live in one of the units of the last project. Didn’t impact my vote at all, but it was fair for whoever pointed that out to do so. Thanks for attending the meeting. The article is awesome! It’s interesting that Mr. Jallos in one statement says a 6ft fence is to provide a “courtyard effect” the next statement is to keep away the “drunks that walk by”. How would he know he doesn’t live here. Maybe the six foot fence would allow him and his father live here instead of across the alley where he said they were going to live on the last project. I agree diversity in design is great for the neighborhood, but how many blocks have the same design repeated four times? 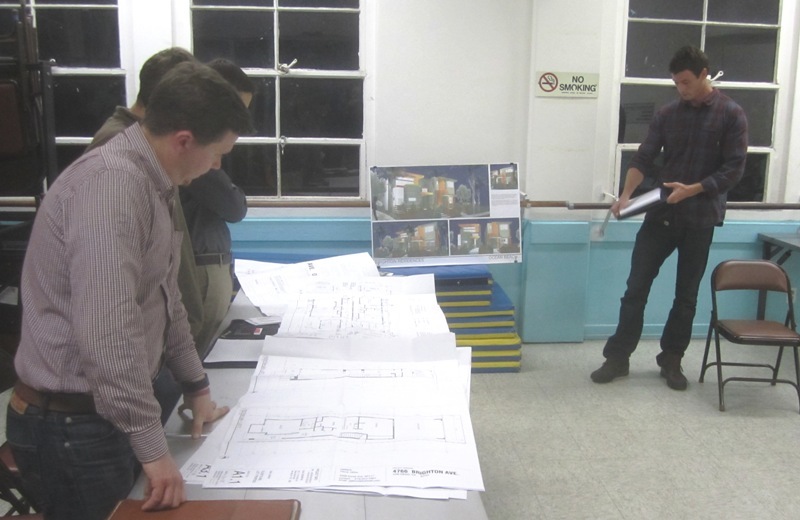 R U referencing the same design as in beach cottages or the project? Are you serious? Several blocks have similar designs all over OB. Also, I don’t blame the courtyard answers either way. I would love to have a fence around my yard to both provides a courtyard effect and to keep the drunks out. I live at the other end of the block in question, so not much impact on me. BUT every other lot that has been Condominimized has had the decency to leave the street unit one story and built up the back unit to 2 story over garages… It would also seem better for the tenants not being that close to each other. Also you know that that dead alley will become. And who would not want windows on both sides of the house for natural ventilation and light? Putting the houses front and back will create a much nicer, larger and private courtyard. I just don’t get the reasoning for splitting a large lot down the middle.